No pressure, we just want to fall in love with you. And we mean it. Publishing credits are great and we will celebrate your portfolio with you but we value people over product and if you can give us a taste of who you are and sell us on your winning personality, we're going to want you in our tribe before we even read your submission. Perhaps BUT we have a vision of creating a community of connected creatives who are likeable as well as talented and, the truth is, if you can write a winning cover letter, we're pretty confident you can write a winning submission! There are thousands of online resources telling you how to write a cover letter but we want to give you permission to ignore all of them! That's why we laid it out simply in our guidelines. 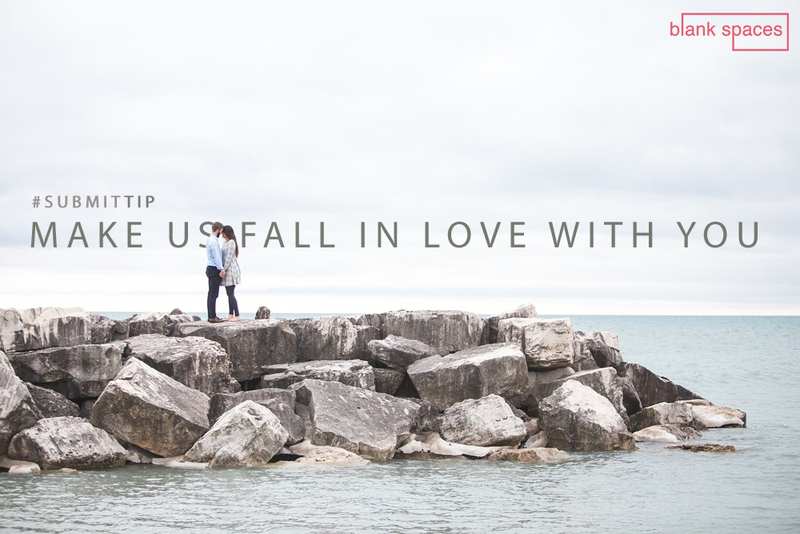 Forget what the experts say—at least when it comes to submitting to us—and really, just help us fall in love with you! Our favourite submission letters, so far, have been the ones that feel personal, that show us who a person is beyond the words on the page. Some use humour. Some use vulnerability. Some are simply written in a posture that feels warm and genuine. We don't want your cold, hard, cover letter. We want to meet the you that meets your friends for a cup of coffee or a glass of wine. We will leave you with this example. It's ballsy and silly but it does exactly what we wanted it to do: we fell in love. Now (full disclosure) this actually came from my sister so, granted, she probably felt a little more ease in her boldness AND she knows my sense of humour, but take this as permission to get crazy. Trust us—it will only help your chances of being accepted. Please consider the below submission for your absolutely, wonderful, brand new, awesome magazine. I am the sister of an incredibly talented writer, who has just recently started her own magazine. Obviously, I will never be as talented as her, but with her as a sister, and another writer as a father, there is a lot of familial pressure to at least give this writing thing a little bit of a shot. And, hey, I know when to use "seen" versus "saw", and the difference between "there", "their", and "they're", which is quite the accomplishment for the area in which I live. I am also familiar with punctuation, and use it on a daily basis. Based on these facts alone, I am obviously a very skilled writer, and it's only a matter of time until I make millions of dollars on my brilliant book, that I have not yet started, nor thought about it. (See how I used the word "nor"? Non-writers just can't do that.) I have included a copy of my brilliance below, for which you will be honoured (see the "u" there? Absolute proof I'm Canadian) to put in your magazine, or blog, or trashbin, if you so choose. This piece is sure to up the quality of your entire magazine based on its pure brilliance. I would like you to be aware that the fact I am offering this to you to use in your magazine, and not demanding compensation, is incredibly generous of me, since I'm sure any other magazine would pay vast amounts to print it themselves. The below brilliant piece of literature could be a blog post, or magazine article under the category of Shameless, or Story Matters (if you think it fits), or a fire starter. What Heidi missed in her letter was a brief description about her article; however, this was so fun to read, we hardly noticed the oversight AND her piece has gone on to be approved and it will appear as The Final Word in our December issue—not because she's my sister, but because she baited us well with her witty banter. Make us fall in love with you! Obviously, we don't want to walk out on a pier with you to share a kiss while waves crash against the rocks...or maybe we do...I guess it's all up to you. Hint 1: we appreciate clever self-deprication, not disingenuous humility; we love sarcasm, not meanness; we want honest voices, not mimics; we watch for clever turn-of-phrase, not perfect spelling/grammar; sure, flatter us, but don't let it sound hollow. Hint 2: Blank Spaces is its own entity. 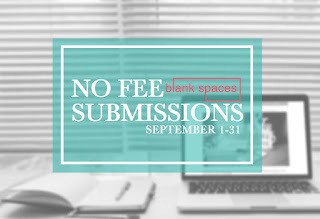 Don't apply our advice to your submissions to other literary magazines. Always read through a publications guidelines because every one is looking for something a little different. While we might be looking for wit and warmth, another might want nothing more than a dry resume. Neither is wrong but it's your job to know who wants what and to do your best to meet those requirements. This looks like a great tip, for almost anybody applying for a job or a position. If you are a person everyone loves having around them, there's a very less chance you'll be denied a position or job.